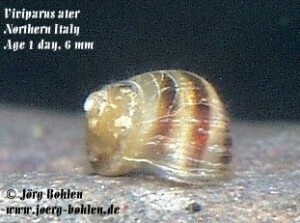 Here are pictures of Viviparus ater from northern Italy. We found the species in a quite nasty stinking, muddy roadside ditch close to the village Noale in the coastal plains. 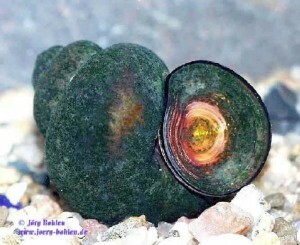 It is a very hardy species and maybe the best suited Viviparus for aquarium purpose. I keep a group of the stock in an aquarium with a winter temperature of about 8-12 degree, and the snails are active during most of the winter. Another group I placed into our warmwater home aquarium, where temperature is about 27-32 degrees over the whole year, and they grow well and produce offspring. The latest pictures are of this 6 mm freshborn snail of Viviparus ater, it has no rows of hairs (sorry, bristles) on the shell. 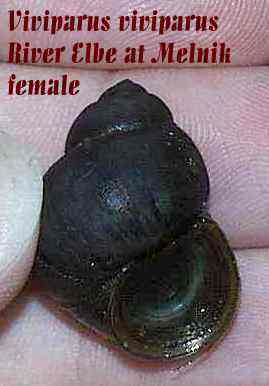 The riverine V. viviparus is found only in flowing waters, especially in middle and large rivers with sand bottom, some stone stubstrates and underwater vegetation. 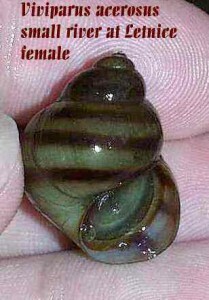 The species is often mixed with V. contectus, which is more widespread and can be collected more easy. In comparison to V. contectus it has much less pronounced bowing of the winding and a non-pointed tip. 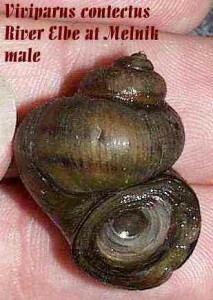 Usually is stays smaller than V. contectus http://topcollegepapers.net/. I have not much experience with V. viviparus in aquarium, in the only two trials of mine they produced only very few offspring and the adults died after less than a year, so (even without knowing the reason) I consider it a more problematic species than V. contectus or V. ater. By chance I recently got some specimens of V. acerosus, a species which is found in southeast Europe and the basin of the River Danube and which resembles much V. ater. The locality where plenty of these snails were visible was the shallow shore of a 10m wide channel with little water movement, sandy to muddy bottom and few underwater vegetation. I have no experiences with this species in aquarium, so I cannot say anything to its suitability as aquarium pet. 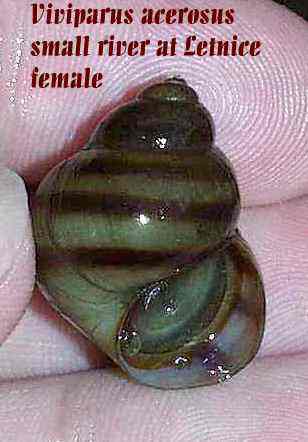 It is reported in literature that males have a more slender and much less bowed shell than females. V. contectus is a widespread species and found in calm waters, usually standing water with submerged vegetation and a slightly muddy bottom. It does comparably well in aquarium, although the keeper should always have a special eye on the animals and make sure they find enough to eat. You can feed them with fish food for ornamental fishes, best are tablets or flakes. A problem in my aquaria is the high temperature during the summer (24-32º C). 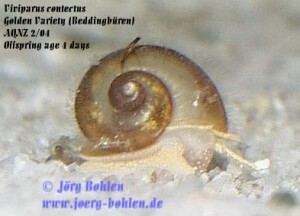 At this temperature, the young snails have a high mortality rate and sometimes I am left with no offspring. Also the adults have a higher mortality rate at high temperatures, so best is to keep them at 22-24º C (or to choose a different species like V. ater). 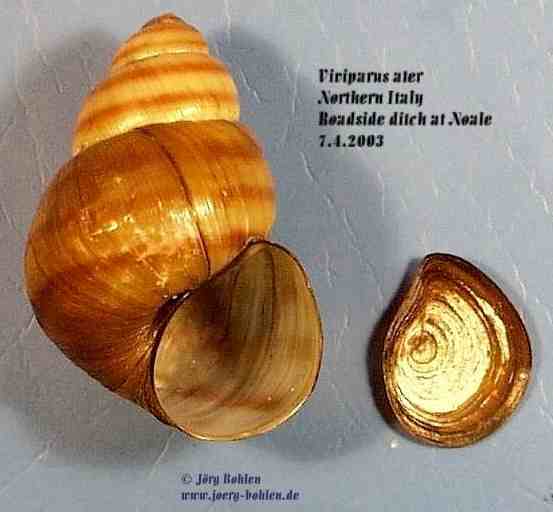 As a boy I collected Viviparus contectus in a small village ditch close to my hometown and kept them in aquarium. From this population I from time to time took specimens for aquarium during the next 10 years and collected first experiences with keeping, feeding and finally breeding them. 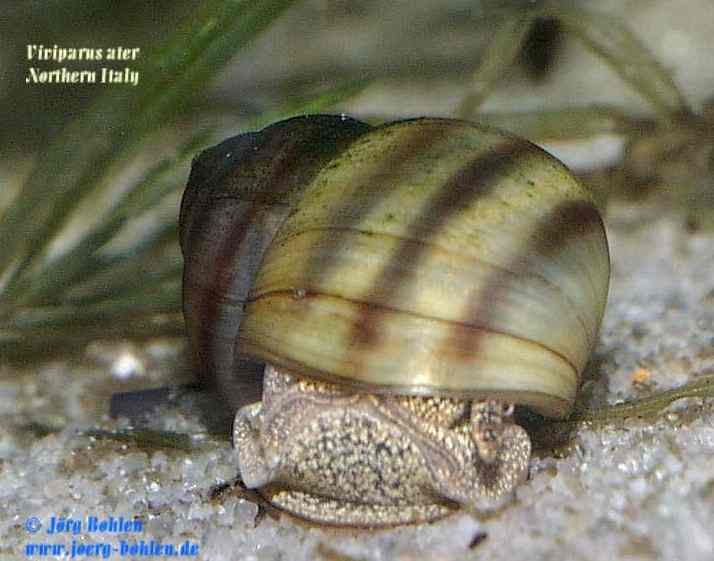 Several years later, I saw a photo of V. contectus in a book and was quite surprised to see that the pictured specimen had a dark grey body. My onces all had a shining orange body. Nowadays Essays Captain I know that V. contectus usually is dark and only some populations are orange. 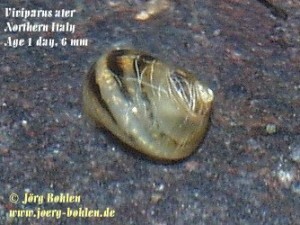 Some months ago (December 2003), I visited one of the localities of the golden form again and took some specimens into aquarium. They gave birth to babies last week (February 2004), and the first two pictures above show one of these babies just a few days after birth. 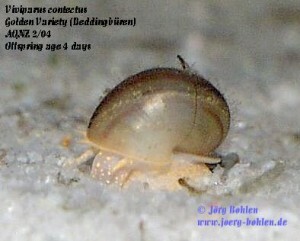 On the pictures you can see the rows of dense hairs, which are typical for young V. contectus. I assume they serve in camouflage, since dirt attaches easily to them and gives the small snail an organic coat. 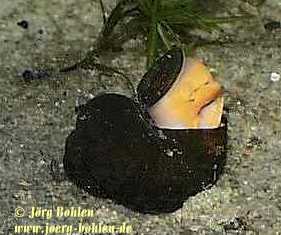 The adults still are mainly closed in their shells all the time (see photo 3), but today (4.3.2004) I can present a pictures of an open specimen, so that you can see their orange body. The shell of this orange form is normally pigmented, that means light brown with red-brown stripes (even if it is a little bit difficult to see on the photo because the shells are strongly overgrown). Besides two localities at the lower Weser River (northwest Germany), I learned about a golden population in the coastal plains of Schleswig (northern Germany) from a friend.